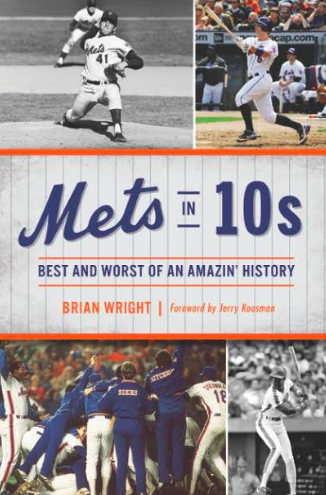 Given the early extremes of optimism and pessimism for the 2018 Mets, perhaps it’s appropriate that writer Brian Wright has authored the recently published, “Mets in 10s: Best and Worst of an Amazin’ History.” It’s a collection of lists and stories of Mets history that covers championships and collapses, the player heroes and busts, and the wonderful and the weird moments that have rewarded and pained their fans for half a century. Brian and I spoke on June 10 about his book and shared our experiences about rooting for them. Brian is a first-time author and life-long Mets fan who has also written for Bleacher Report, the Washington Examiner, and The Sports Daily. 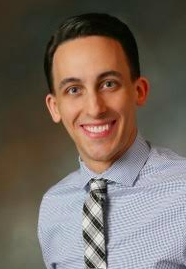 Although Brian’s family is from the New York area, he was raised in northern Virginia while his father served in the Navy and worked at the Pentagon. Distance from New York didn’t deter Brian from adopting the Mets as his team as he recalled wearing out videos highlighting the Mets 25th Anniversary and the 1986 championship team as a youngster in the early 1990s. As for the genesis of the book, Brian cited Chase Utley’s infamous slide that broke Ruben Tejada’s leg in Game 2 of the 2015 NLDS. “Amidst my rage after the play,” Brian said he began to think about where Utley ranked among all-time Mets “villains.” This lead him to thinking about who were the Top 10 Mets villains which in turn lead to him thinking about other “Top 10s” in Mets history. When I asked what chapters were the most difficult to write, Brian’s answer captured the extremes of rooting for the Mets. While “Single-Game Pitching Performances” was difficult to write because the Mets history of stellar starting pitching yielded many candidates, “Busts” was also difficult because he had to merge draft picks who never made it with free agents who failed to perform in a Mets uniform. Brian didn’t claim to be “the authority” on these lists and said he’d like the book “to spark debate and not end them.” In fact, even as he looks back on his list of best Southpaw Starters, he wonders whether he would change Sid Fernandez’s ranking and rate him above Bob Ojeda. He decided to rank Ojeda above “El Sid” in the book because Ojeda was the “most important pitcher on the best team in Mets history” yet he noted Sid ranked among Sandy Koufax, Nolan Ryan, and Clayton Kershaw with regard to fewest hits allowed per nine innings. As we looked back at some of the trials of rooting for the Mets, Brian said, “You run the gamut of emotions with the Mets…They can warm your heart in one instance and break your heart in the next one over the course of an at bat.” Yet he laughed as he recalled telling friends of his who root for the Nationals after the Mets dropped the opener to the Yankees 3-1 this past Friday, “I just can’t do this anymore.” Did this mean he was giving up on the Mets entirely his friends asked. “Just for tonight. I’ll be back tomorrow,” he replied in typical Mets fan fashion. Mets in 10s is well researched and very informative without being a bland retelling of facts (even the most avid fans will say, “I didn’t know that.”). It’s well written, light-hearted yet an honest retelling of Mets history. It’s an enjoyable read. Keep it in mind if you’re looking for a last-minute Fathers Day gift or a book to read while relaxing on the beach this summer.